Upgrading the Char B1, the Char B1 bis had thicker armour and an APX4 turret with a longer-barrelled (L/32) 47 mm SA 35 gun, giving it more anti-tank capacity alongside the 75mm hull-mounted howitzer. French experiences during The Great War influenced their belief a breakthrough tank would be needed in future conflicts, hence the design of the heavy Char B1 and B1 bis. 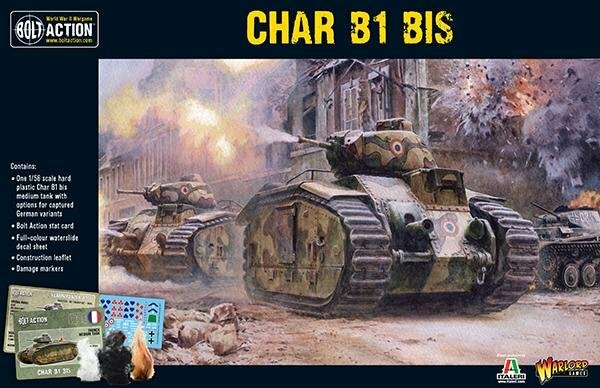 Among the most powerful tanks at the time, the Char B1 bis was very effective against German Panzers in 1940 during the Battle of France. However, slow speed and high fuel consumption made it ill-adapted to the more fluid style of warfare being fought at that time. With the fall of France, the victorious German military captured 161 Char B1 bis tanks and repurposed them under the nomenclature Panzerkampfwagen B-2 740 (f). Several were also converted into flame-throwing tanks.